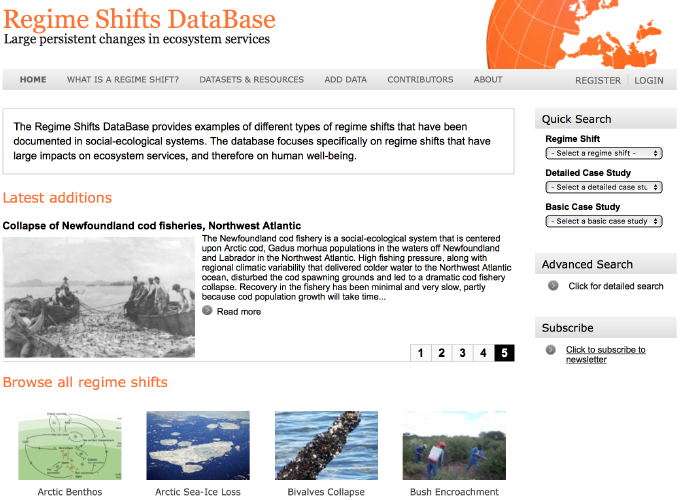 The Regime Shifts Database: A framework for analyzing regime shifts in social-ecological systems. This paper presents the Regime Shifts Database (RSDB), a new online, open-access database that uses a novel consistent framework to systematically analyze regime shifts based on their impacts, key drivers, underlying feedbacks, and management options. The database currently contains 27 generic types of regime shifts, and over 300 specific case studies of a variety of regime shifts. These regime shifts occur across diverse types of systems and are driven by many different types of processes. Besides impacting provisioning and regulating services, our work shows that regime shifts substantially impact cultural and aesthetic ecosystem services. We found that social-ecological feedbacks are difficult to characterize and more work is needed to develop new tools and approaches to better understand social-ecological regime shifts. We hope that the database will stimulate further research on regime shifts and make available information that can be used in management, planning and assessment. © 2018 Juan Carlos Rocha · Powered by the Academic theme for Hugo.